Chemistry is a form of science, that is widely used in our daily lives. It helps answer many questions that we have about our world. Lets explore how! Chemistry is the art of understanding occurrences conducted by matter, by the analyzing the actions of atoms and molecules and their role in the matter and the occurrence at hand. Chemicals are concerned with properties of certain substances, the properties of particles the make them. An example is soda pop. The soda pop is consisted of atoms, and these atoms come together to make molecules, which when reacted with an external “object” or molecule, than will invoke changes to the original object of focus. Thus making it a chemical. Chemists try to answer questions and theory’s/hypothesis which’s solution can solve things ranging from a scientific discovery to a cure to a disease, and even just a simple thought/idea from themselves or even a child. They understand the natural world by learning about it’s properties and applying it into the work that they do. That knowledge is then used in improving our natural world or explaining it. Chemistry is connected to our everyday life a few ways. In my definition in the preceding question, I noted the relation of matter and molecules. Atoms, molecules, matter are all things that are everywhere in our world from our living organisms to our non living objects, they are apparent and make up those objects. Chemistry, helps us understands many of the common or even uncommon occurrences in our daily life (those will correlation to matter and molecules), and helps us utilize them to our advantage. Is the fizzing of soda chemistry, and why does soda fizz? Yes, the fizzing of Soda is chemistry. The process of Soda fizzing is one that is a result of chemical reactions which react together, thus causing fizzing as a by-product. In soda, fizzing occurs in the interactions, or bonding of the elements of carbon dioxide, and oxygen. Carbon dioxide consists of the elements oxygen (2) and carbon (1). Oxygen consists of hydrogen (2) and oxygen (1). The carbon dioxide molecules are bonded in a straight line, where as the water molecules are bent. This allows and fulfills the differences between the water molecules, allowing it to be a liquid, and carbon dioxide molecules, making it a gas. The sugar molecules allow these two substances to interact. The pressure, added by the producers, cause a reaction and “mixing” of the gas and the liquid, thus making the soda fizz. 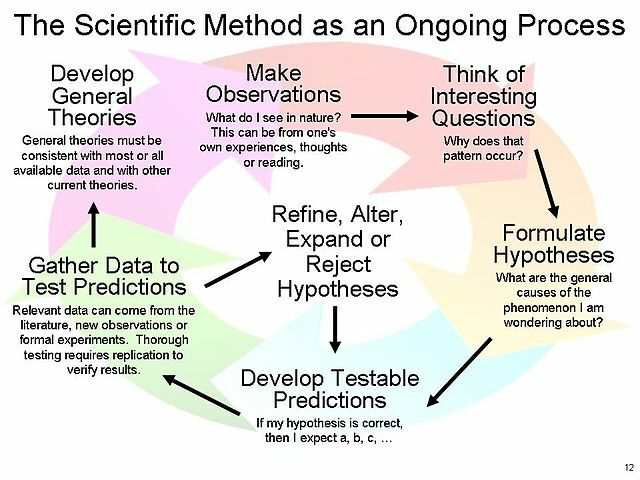 An example of the scientific method at work is during a procedure or an investigation. Lets say some one wants to figure out why leaves are green. The obvious answer is due to chlorophyll, however lets assume one did not know that, and google also does not have the answer. As per the method, the kid (the person who is conducting the experiment) first will observe the lead. He then will make a hypothesis or an educated guess based upon his observations or prior knowledge. Or in s real case where google has, the answer or law, he can always try to prove or disprove the law that is already in place. Then the kid will test and revise his hypothesis or the law based on experiments that he does. In our case an example can be finding out that the green in the leaf is not only a color, but also involves pigments by rubbing it against a white surface. This proves that there is a substance making the leaf. Than the kid would have made a theory that the leaf is green due to a substance that is in the leaf. The kid, then will test this theory by understanding the aspects of color change in the leaf, and if the substance has any correlation to the change. Than he will either confirm or revise his theory, as he does in the preceding steps, and then eventually finalize and share his knowledge with others.